When we open the box we see our motherboard, a CD, driver floppy disk for the Highpoint controller, cables, the audio module and documentation. The CD includes a driver diskette creator, user manuals, McAfee Anti-Virus, drivers for the ALi chipset, the on board sound and utilities for the Highpoint RAID controller as well as hardware monitor software. The floppy allows one to install drivers for the RAID controller in NT or 2000 during the OS installation process. There is also a floppy cable and two 80-conductor IDE cables. The audio module upgrades your standard two-channel audio to the 5.1 sound built into the C-Media's CMI8738 MX sound chip. The module is merely a bracket, with a rear and center channel jack, that plugs into the motherboard. 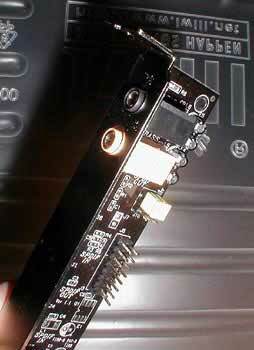 The motherboard also can have the optional "Super Audio" module, which adds a pair of SPDIF inputs and SPDIF outputs. In an age where some motherboard manufacturers tend to save some money by not printing up very extensive manuals and putting most information on CD, Iwill had no reservations about killing a few trees for each XP333R motherboard. Sure, the documentation that the other boards out there lacks helps the "know enough to be dangerous" syndrome that some newbies may experience. As a PC tech, far too many times I'll get a call from a first time computer builder with documentation overload that can't get their PC to POST because "the manual told him to change all of the jumpers". Well, the Iwill XP333R is not a newbie's motherboard. It's an enthusiast's board. And enthusiasts want to know about every little aspect of their motherboard. The first piece of documentation is the "easy installation guide". It alone is more informative then some board's entire manuals. 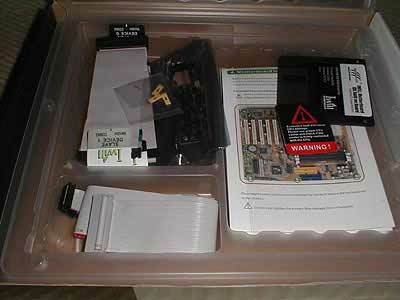 The easy guide has a checklist of the contents of the box, a diagram identifying the components of the motherboard, how to unpack and install the motherboard, installing the processor and memory, installing the heat sink, installing the audio module, setting the jumpers and the BIOS as well as basic troubleshooting steps. The manual itself is a hearty 56 pages that covers not only the aspects of the hardware, but the software as well. I'm impressed with the complete break down of every aspect of the board. For example, each pin of each connector is defined, and each option in the BIOS is broken down and defined. Very nice. One also gets a separate manual for the Highpoint HPT372 RAID controller. However, the manual covers the software aspect of the RAID controller more than anything, and not the hardware. What Makes The Perfect Motherboard?